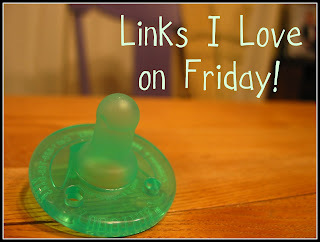 It has been a while since I have left a few links that I love. To be honest, I have been a little blogged out this week. Maybe it is the spring weather we were blessed with - busy outside - harder to take a moment at the computer. Maybe it is that I have almost hit 100 followers and that is very exciting and a little overwhelming. Or maybe it is just the flow of blogging - there are times when there are days I could post 3 times and times when I am too busy living life....and I guess that is what I have been trying to focus on this week - Living life. Enjoying the weather. Being present with my boys. Going to bed early. And trying to feel 100% again. Who knows...but today here are a few links I have come across the last few days that have stayed with me. Enjoy! This one titled: Somebody Wants What You Have is powerful! It reminds me to approach some of the little frustrations with a different outlook. Go Ahead, Let Motherhood Redefine You This post has a number of great points. Being a mother is the biggest challenge I will have and it is also the experience that will teach me most about who I am. This post touches on why this is true. Meghan writes a blog about being a mom to her three kids. EVERY. POST. has me nodding my head - meaning I get it - I have been there - that is my life. I have no idea where she lives - but I do believe that her post on Groceries this solidified the thought that she would be a great "real life" friend if we were neighbors, shopping at the same Target, disheveled - but thrilled to have accomplished the days errands with one, two, or for her - three children in tow. Her post was me - almost exactly on Monday morning! Nine Words women use was posted on a new blog I came across. I don't think Ali wrote this - from the way she posted it. It reminds me of one of those forward emails that goes around. I will have to check with her. But I thought it was HILARIOUS - and SO TRUE! And I am so glad she posted it. It gave me a chuckle! And if you have 5 minutes today - READ THIS POST from the blog Enjoying the Small Things - it is such an amazing birth story. One that will sit with you. One that will stay with you. One that you will want others to read. Have a great Friday friends. It is cold here again. Boo! But I also kind of like the way the seasons change here in Minnesota. A few beautiful days and then they are ripped from our little hands for a few days....but I know they will gently be handed back to us again - and soon enough they will be here to stay. This post is linked to Tidy Mom's I'm Lovin It on Fridays. Thanks for some great links...I'm off to check them out!! Thanks for linking up! Have a GREAT weekend! Great Links, Sarah! I'll have to try to remember to come back here and go check them out this next week while I am hanging out in my recliner (being waited on hand and foot) using blogs for company while recovering from knee surgery! Especially the funny one since everyone knows laughter is really good medicine! Going to check out those links! Thanks! Thanks for sharing! I love reading new blogs!!! Hope it warms up for y'all. We're supposed to get a cold front here in TX tomorrow, but that means we'll be in the 60's! Have a great weekend!!! This is awesome! I love reading what some of my favorite bloggers love reading, and look forward to following the links! Thanks for the link up! :) I love to read your blog! I cried at the link about the grass being greener. I'll never get mad at my husband for forgetting to take out the trash again. Wow! That birth story was powerful! wow--the baby story....was so powerful. can't believe she had it in her to write it like that. brought me to tears.